Likewise, French President Emanuel Macron also claimed the strikes target Syria’s capability to launch chemical attacks. “We cannot tolerate the normalization of the use of chemical weapons,” he said in a statement issued shortly after huge explosions were heard in Damascus early Saturday followed by the sound of airplanes overhead. The three countries used an alleged chemical attack in the Eastern Ghouta suburb of Damascus last week as a pretext for their military action. They blame the Syrian government for the attack, without offering any evidence. Syria has strongly rejected any role in the suspected attack, which came just as the Syrian army was about to declare full victory against the militants operating in the region. The NATO military alliance also voiced support for the military action. “I support the actions taken by the United States, the United Kingdom and France,” NATO Secretary General Jens Stoltenberg said in a statement, claiming … the campaign will reduce the ability of Syria to launch chemical attacks. The Britain-based Syrian Observatory for Human Rights said the strikes hit bases and chemical research centers around the capital Damascus. Syrian state TV said the attack hit the country’s army depots in the area of Homs, adding that Syrian air defense systems shot down 13 missiles. 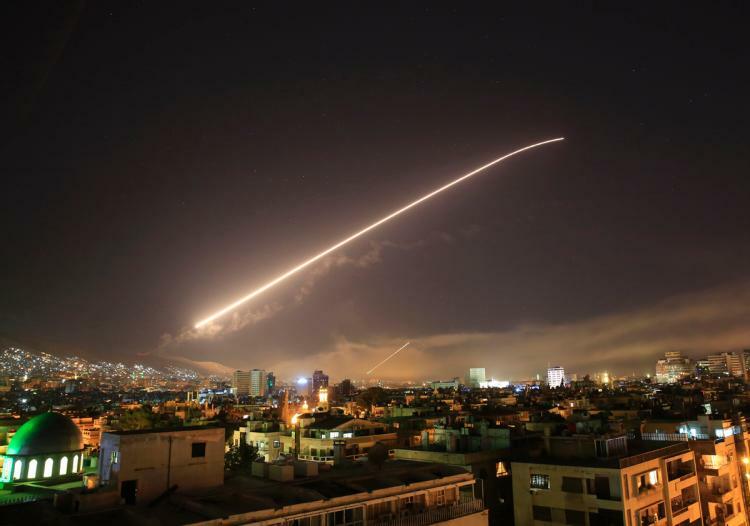 A Reuters witness said that at least six loud explosions were heard in Damascus with smoke rising over the Syrian capital where a second witness said the Barzah district, the location of a major Syrian scientific research center, was also hit in the strikes. US Secretary of Defense Jim Mattis said in a press briefing that the air strikes on targets in Syria were a “one time shot,” noting that future strikes will depend on whether the Syrian government uses chemical weapons. The Pentagon chief added that the US and its allies struck Syria harder than they did last year. General Joseph Dunford, the highest-ranking officer in the US military, said Russia’s forces in Syria had been warned through existing “deconfliction” channels that Western planes would be in Syrian air space. There have been contradictory reports on the number of missiles fired on Syria. A pro-Syrian government official said 30 missiles were fired, but the Pentagon put the number at 100.